The Midwest was where it all began for Barack Obama – and for me. Democrats and Republicans hold the first primaries for the nomination of their Presidential candidates in Iowa. 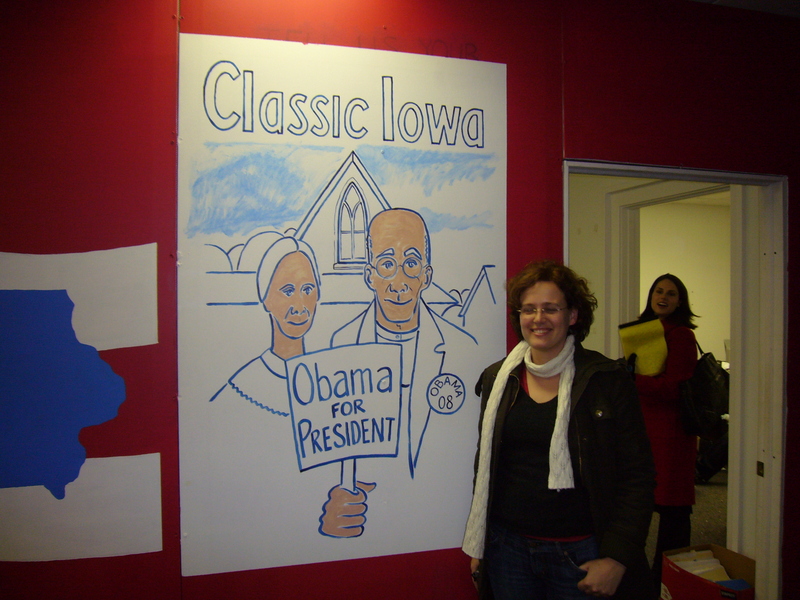 Two weeks into my assignment as FTD’s Washington correspondent in December 2007 I was on a plane to Des Moines. Don’t be fooled by the French spelling – the way the locals pronounce it, it sounds like the “oink, oink” of a pig. There are many pigs in Iowa, and as I found out, they would play a big role in Obama’s victory. I arrived late in the middle of a snowstorm, but luckily I did not have to drive the next day. Dave Murphy picked me up in an enormous SUV. He was an activist against hog confinement – an issue of great importance for Democrats in Iowa. Dave told me that most industrial pig farms in Iowa were owned by Republicans – and ecologically minded Democrats wanted to know who would be prepared to fight them. We drove past one of those farms and saw the incinerators in which the pigs were burnt that had died from suffocation. The neighbors, Les and Vicky Anderson, were Democrats who complained about the smell and the pollution. They were going to vote for John Edwards. But Dave, who was close to the Obama campaign, informed them that Hillary Clinton was “a big corporate act” and that as a Senator John Edwards had been in bed with the meat industry. “Maybe we won’t vote for him after all”, the Andersons said as Dave trudged back to his SUV. I had enough material for a feature story. This was my first insight into the effectiveness of Obama’s grassroots campaign. When I returned to Iowa after New Year, I was convinced that the newcomer from Chicago could beat the frontrunner Hillary Clinton. And he did. I covered the Iowa caucuses in John Wayne’s hometown Winterset. Obama’s nomination as a candidate and his election victory gave me several opportunities to visit his hometown Chicago which charmingly combines a Manhattan skyline with the friendliness of the Midwestern people. In the summer of 2008, my colleague Olivia Schoeller of Berliner Zeitung and I explored Obama’s Chicago. We talked to activists in the South Side, where he had been a community organizer and to professors at the Law School where he taught. I was very impressed by Leon Despres, a political veteran in Obama’s Hyde Park neighborhood. The 100 year old former alderman and fighter for racial equality told us that he was “ready for change”. In 2010, Christina Bergmann of Deutsche Welle and I traveled back to Chicago before the Midterm elections and talked to Judy Lewis who was still fired up and worked the phones for Obama’s Democrats out of a community center in Hyde Park. She was one of four American voters whom I profiled in FTD. But outside Obamaland, it looked bad for the Democrats. 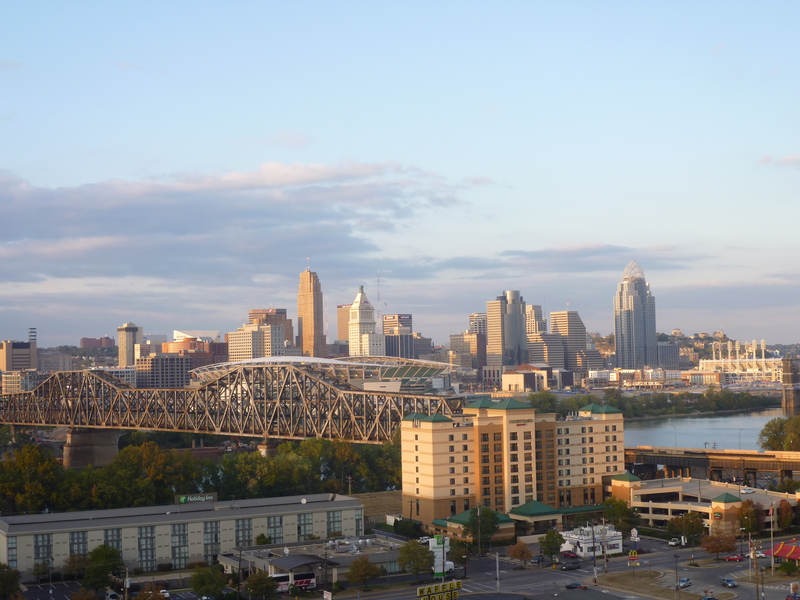 In Cincinnati, Christina and I reported about the uphill reelection struggle of Democratic Congressman Steve Driehaus who had ridden the Obama wave into the House of Representatives in 2008. Driehaus left no stone unturned, and we met him in a Black Masonic Lodge whose members had invited him to speak there. I had never heard of black freemasons. And the masons had never had two white female reporters attend one their secretive meetings. For Driehaus, it not enough: He lost his seat to the Republican Steve Chabot. Ohio was a crucial state again in 2012. Due to its mix of white working class voters and religious conservatives, it is a microcosm of the U.S.. During the Republican primaries in the spring of 2012, I interviewed fundamentalist Catholics in Steubenville about family values and their feelings towards the Mormon candidate Mitt Romney. I also wrote about the first signs of a recovery in the former steel town Youngstown that had been hit hard by the economic downturn. The mood was still subdued, but more upbeat than in Cleveland during the subprime mortgage crisis in 2008. The upward trend helped Obama in November 2012 – but he could not have pulled off a victory without his formidable campaign apparatus. 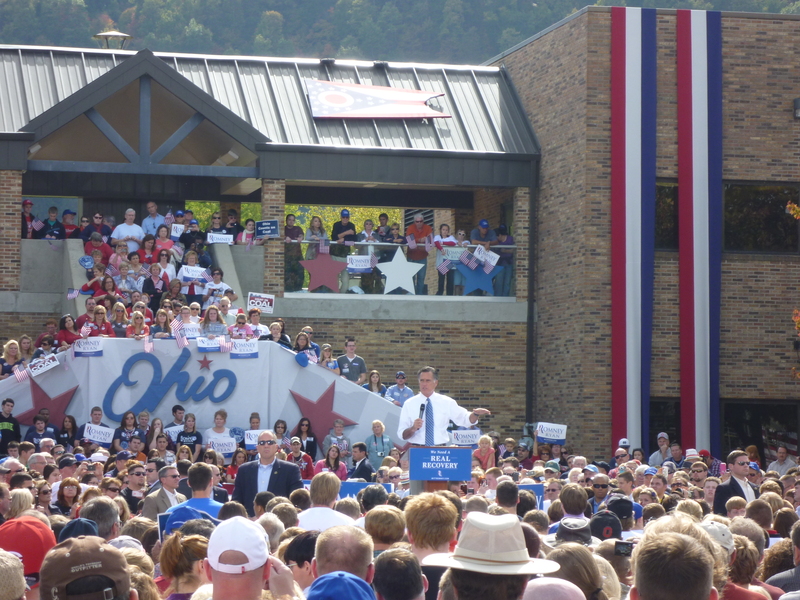 Two weeks before the elections, I traveled to Ohio with Romney, and felt that the Republican had a fair chance to win. After Obama’s weak performance in the first debate, Romney was on a roll, and his supporters seemed very energized. 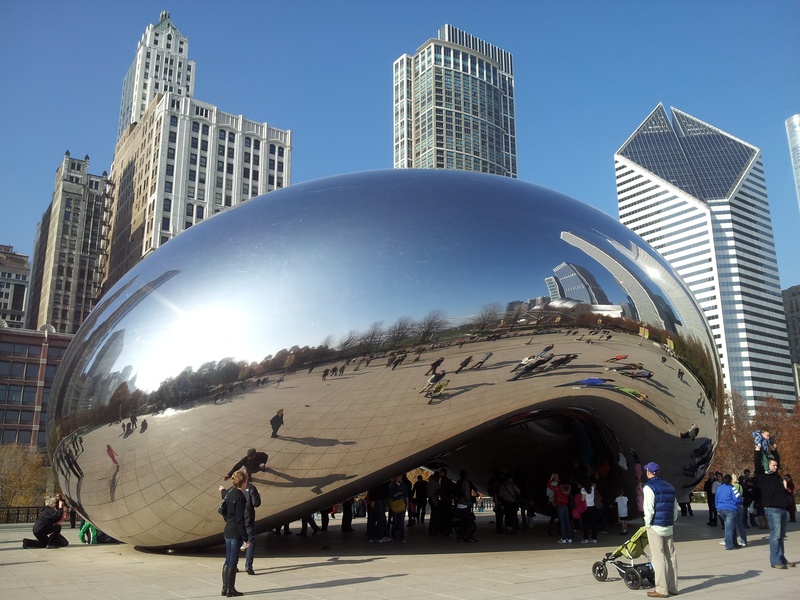 In November, I traveled to Chicago again, this time with Kathleen Gomes of the Portuguese daily Público. We attended a service in Obama’s former church whose pastor Jeremiah Wright had caused a stir in 2008 with what was seen as anti-American sermons. And we met some of the same people Olivia and I had met in 2008, from one of Obama’s companions on the South Side to Bruce Sagan, the editor of the Hyde Park Herald. They all confirmed my impression of a tight race: Even the “Obama Momma” Loretta Augustine-Herron worried that Obama would not make it. On Election Day, we visited an Obama campaign office in Wabash Street, where volunteers were still making phone calls to voters and got on buses to travel to neighboring swing states. “We won’t stop until 11 pm – or until Obama has won,” we were told. They could stop well before 11 pm. 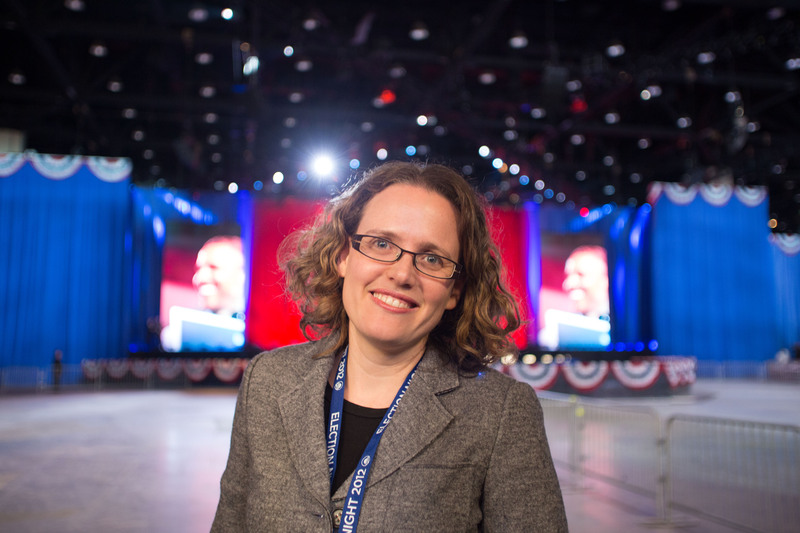 Here is my article about the big celebration at Obama’s reelection party in McCormick Place. This entry was posted in The Five U.S.Years and tagged Barack Obama, Chicago, Cincinnati, Des Moines, FT Deutschland, Hyde Park, Iowa, Midwest, Mitt Romney, Sabine Muscat, swing states, U.S. elections. Bookmark the permalink. Reading this was much better than following the end of the 2008 campaign on TV. Your words take us right there, Sabine.